HOUSTON – The University of Texas Health Science Center at Houston (UTHealth) School of Public Health’s Master of Public Health is ranked first in the 2018 Healthcare Management Degree Guide. Students can pursue an M.P.H. degree on one of six campuses across the State of Texas: Austin, Brownsville, Dallas, El Paso, Houston, and San Antonio. The guide cites low tuition and a low student-to-faculty ratio, as well as the length of the program and credit hours required as the qualities that make the program standout among the list of 35 “top-notch” programs. Master of Public Health degrees are available in the following areas at the School of Public Health: biostatistics; environmental health; epidemiology; health promotion/health education; community practice; health services organizations; healthcare management; as well as general or customized degree programs. Many of the classes can be attended online. 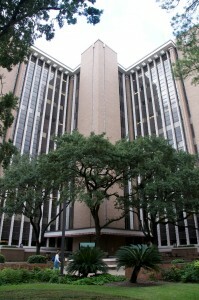 For more information about the Master of Public Health degree program at UTHealth School of Public Health, visit the website at https://sph.uth.edu/academics/degree-programs/master-of-public-health-mph/.